Natural light lifts spirits, makes spaces appear larger, and reveals our world in its true color. Beyond its aesthetic appeal, it also reduces eyestrain, increases our productivity, and lessens electrical demand. Unfortunately, today's buildings rarely have enough natural light. But, now it's possible to change that with affordable, yet highly advanced tubular skylights. Using a revolutionary, innovative design, you can capture sunlight on your rooftop, redirect it down a highly reflective shaft, then diffuse it throughout your interior space. The result is remarkable. The product is Solatube®, The Miracle Skylight. Brighten Up® Series makes daylighting any interior affordable and easy. Need to light a small space, such as a bathroom, hallway, closet or home office? Choose our compact 10" Solatube. 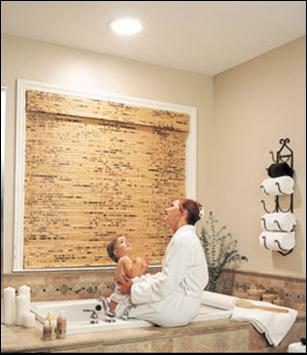 Use the 14" Solatube to bathe your larger living areas in sunlight. It’s perfect for kitchens, stairwells and entryways. For more expansive areas, use either size in multiples for a unique architectural lighting effect.